It’s that time of year again! Arts in the Parks has officially begun and what better way to start the summer than with a group of artists who made last year’s Arts in the Parks so special? Coming off of a successful run of performances in 2017, this year Japanese taiko group Nagata Shachu is mounting Taiko X Blues in the Parks! As the name would suggest, this program is heavily inspired by the blues and features two special guests to boot. 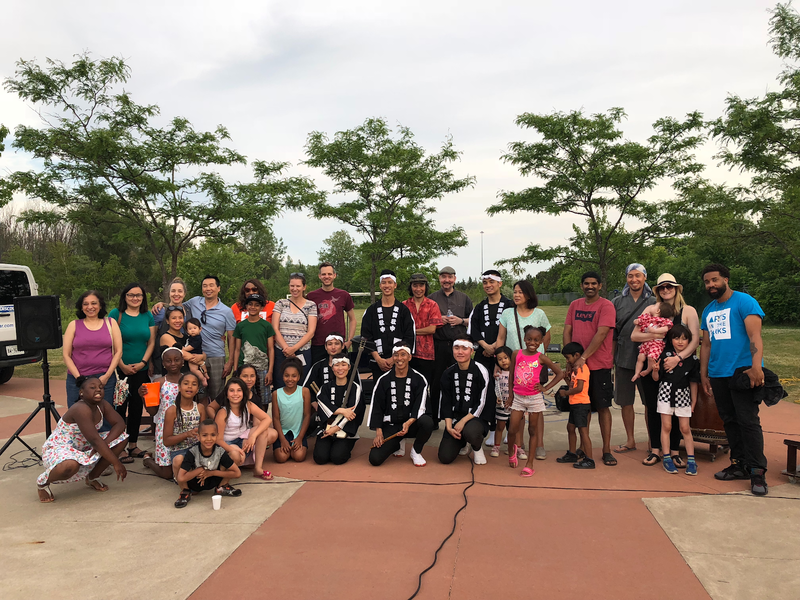 On June 16th, Nagata Shachu gave the first of three performances, kicking things off in Scarborough’s Bob Hunter Park. Located behind Chief Dan George Public School, a large, grassy expanse covers most of the area, as well as a small playground and splash pad. Surrounded by trees and nestled in a residential neighbourhood, the park provides a welcome secluded refuge. The space is deceptively wide and as the evening got underway, the thumping rhythms of Nagata Shachu echoed across the park, inviting dog-walkers and passersby alike to come and join the fun. Nagata Shachu was formed in 1998 and is named after its founder, Kiyoshi Nagata, and the Japanese word for group: “shachu”. They are a taiko (Japanese drum) ensemble, but that’s far from the only instrument their skilled members play. Others include the shamisen, a long-necked lute with three strings, and chappa, which are brass hand cymbals. Nagata Shachu’s mandate is to stay true to the traditional form of Japanese folk drumming while creating a distinct voice for taiko that feels 21st century fresh. They certainly “drummed” up some interest on Saturday, even before the music started. The act of setting up the drums in the empty splash pad attracted plenty of attention from kids playing in the park, and by the time they were ready to begin, Nagata Shachu found themselves with a sizeable group of amateur taiko drummers. The timing couldn’t have been better, as the first part of the event was dedicated to a workshop during which everyone got a chance to try their hand at drumming. Participants were led through some basic taiko rhythms and pretty soon the rhythmic chant of, “We love taiko!” accompanied their beats. These newly-minted musicians were rewarded for their efforts when Nagata Shachu took to the splash pad for their performance. They dived headfirst into two traditional taiko pieces, wearing matching outfits while beating drums in unison. The effect was hypnotic; the audience was mesmerized by the synchronicity of the spectacle. You’d be hard pressed to find someone there who was not impressed by the sheer effort the drummers displayed – they beat the drums with a captivating intensity, matched by shouts given out in time to the music. After a couple of standalone performances, the group was then joined by blues musicians Ken Yoshioka and Julian Fauth. Japan-born Yoshioka, now based out of Toronto, offered his vocals and harmonica stylings, while Juno-award winning Fauth lent his renowned talents to the piano. Fusing blues and taiko together proved to be a thrilling match and afforded Nagata Shachu an opportunity to do what they do best: the resulting music showcased fundamentals of Japanese taiko drumming with a twist that was catchy, modern, and new. Before I knew it, the evening the was over and the drums were being packed away. This was my first experience listening to taiko drumming, but I don’t want it to be my last. There is something about the music that draws you in, wakes you up, and makes you feel like it’s part of you. Luckily, Nagata Shachu gathered everyone for a group photo to remember the day by. Audience members, staff, and volunteers gathered around the group and smiled for the camera, cheering, “We love taiko!” one more time. next post: The rise of outdoor cinema: why do we love it so much?